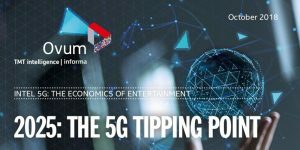 What’s New: According to the newly released “5G Economics of Entertainment Report” commissioned by Intel and conducted by Ovum, it is forecast that over the next decade (2019-2028) media and entertainment companies will be competing to win a share of a near $3 trillion cumulative wireless revenue opportunity. Experiences enabled by 5G networks will account for nearly half of this revenue opportunity (close to $1.3 trillion). Why 2025 is the 5G Tipping Point: The report says that as early as 2025, 57 percent of global wireless media revenues will be generated by using the super-high-bandwidth capabilities of 5G networks and the devices that run on 5G. The low latency of these networks means that no video will stall or stop – livestreaming and large downloads will happen in the blink of an eye. How Media Demand Drives Network Evolution: The “5G Economics of Entertainment Report” forecasts that 5G will accelerate content consumption, including mobile media, mobile advertising, home broadband and TV, and improve experiences across a broad range of new immersive and interactive technologies – unleashing the full potential of augmented reality (AR), virtual reality (VR) and new media. The average monthly traffic per 5G subscriber will grow from 11.7GB in 2019 to 84.4GB per month in 2028, at which point video will account for 90 percent of all 5G traffic. Evolved 3G and 4G networks would offer a degraded experience because the capacity will be insufficient to handle the increased video viewing time, content evolution to higher resolutions, more embedded media and immersive experiences. Forecast to provide $140 billion in cumulative revenues (2021-2028), expanded AR and VR experiences may also enable a whole new channel for content producers to reach consumers. 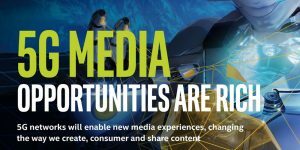 Immersive and new media applications – applications and capabilities that are currently nonexistent – will reach unprecedented scale by 2028, forecast to generate more than $67 billion annually or the value of the entire current global mobile media market – video, music and games – in 2017. How Businesses are Tuning in to 5G: Beyond media and entertainment, all industries are having to adapt to disruptive changes in the business environment, consumers’ habits and public expectations. Businesses are trying to imagine how 5G will transform and disrupt their industry, society and even global competitiveness, as well as beginning to formulate their strategy to embrace the capabilities of 5G. Without the promise of what 5G can provide, growth in many industries may remain stagnant or even decline. When 3G wireless networks launched, no one could have predicted how the mobile world would look today. 4G in the U.S. spawned entire new industries. Companies like Airbnb*, Uber*, Netflix* and Spotify* may not have been possible without 4G technology. “The big question is: What will not be impacted or disrupted by 5G? The next generation wireless network will power diverse digital innovation – everything from the computerization of physical objects to artificial intelligence, ushering in an exciting new world that business leaders and indeed nations need to prepare for,” said Ed Barton, chief analyst of the Entertainment Practice, Ovum. What It Means to Intel: 5G networks will provide lower latency (to be more responsive), greater speeds (to move the increasing volumes of data we produce), and the ability to expand beyond computers and phones to encompass the cloud and a whole new universe of devices (estimated in the billions) attached to the network. Intel is uniquely positioned to power the entire 5G tech ecosystem to support this flood of new data. Intel is no longer just “inside” your computer; Intel’s technological innovation is expanding to 5G network, consumer and industrial applications and the cloud.